Daphne Du Maurier’s 1943 historical novel Hungry Hill covers a period of 100 years (1820 to 1920) in the lives of five generations of two feuding Irish families. Brian Desmond Hurst’s 1947 film adaptation narrows the scope of the story to three generations and a roughly 50-year timespan, but it’s still a lot to take in over the course of just 100 minutes. 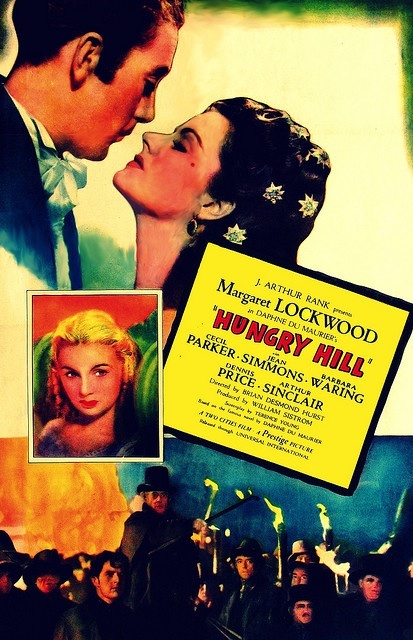 If you’re a fan of romantic yet gloomy historical melodramas, Hungry Hill is a filling dish. And if you’re not, Hungry Hill might leave you feeling stuffed and queasy. While the copper mine ends up providing plenty of employment for the Donovan clan and other roustabouts, tensions are always simmering. A labor riot leads to the death of one young man, and a visit of reconciliation leads to a deadly typhoid infection. Hungry Hill follows a familiar three-generation rise-and-fall story arc. 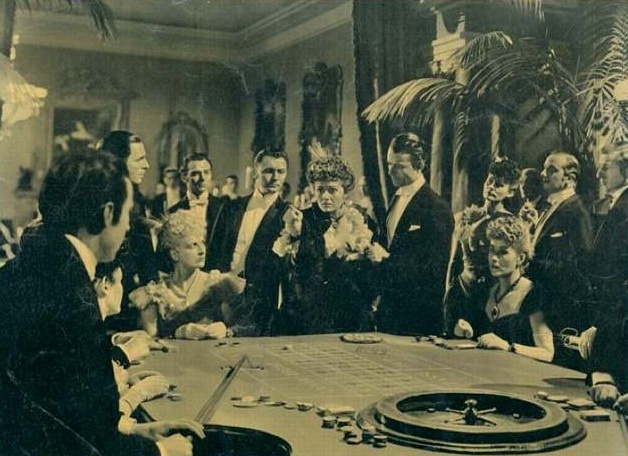 By the time Margaret Lockwood’s hair is brushed through with gray and her face is lined with age makeup, it should come as no surprise to anyone that her handsome son, Johnnie Brodrick (Dermot Walsh), is drinking a bottle of whiskey a day, loving and leaving the ladies, and frittering away his family’s fortune. The scenes between Johnnie and his mother are well-played and affecting, but by that point in the movie I was starting to lose interest in the dismal goings-on. One thing I can recommend unequivocally is the casting, which is excellent. Not only does Hungry Hill feature the cream of the crop of up-and-coming British actors, but the Brodrick men really do all look like members of the same family, and the Donovans resemble one another, too. Of course, this is a double-edged sword, since it’s sometimes difficult to keep them all straight. Posted in 1947, January 1947 and tagged Alan Jaggs, Ann Wilton, Anthony Wager, Arthur Sinclair, Barbara Waring, Brian Desmond Hurst, British Cinema, Cecil Parker, Dan O'Herlihy, Daphne Du Maurier, Dennis Price, Dermot Walsh, Desmond Dickinson, Dock Mathieson, Drama, Eddie Byrne, Eileen Crowe, Eileen Herlie, F.J. McCormick, Francis Crowdy, General Film Distributors, Guy Rolfe, Hector MacGregor, Henry Mollison, Hungry Hill, Ingrid Forrest, Jean Simmons, John Greenwood, Margaret Lockwood, Maureen Moore, Michael Denison, Michael Golden, Muir Mathieson, Patrick Holt, Pete Murray, Shamus Locke, Shelah Richards, Siobhan McKenna, Terence Young, Tony Quinn, Tony Wager, Two Cities Films, Universal Pictures, William Sistrom. Bookmark the permalink.